Lots of conspiracy theories abound regarding the United Nations, but one we don't talk about is the one that's actually true--they fund a secret organization that looks into the stranger parts of life on Earth (and perhaps outside of it!). While they might come to help with your giant creature problem or penchant for turning into a hideous version of Spider-Man (oh the implied shade in that section! ), officially there is no Section Zero. 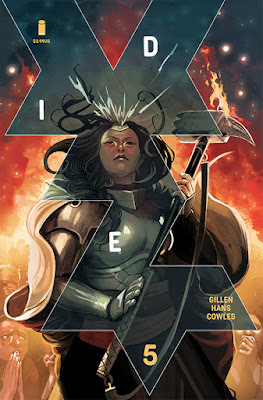 The Kickstarter is getting a wider look with the help of Image Comics (disclosure: I was a backer), as two awesome creators combine for a gorgeous looking book that has the feel of a good late 80s/early 90s book, with quips, strange conspiracies, and quirky characters. It's early yet, so there's a lot of set up, but I love seeing Grummett's art on the page, and even if things get a bit too wordy at times for a modern reader, this new series is off to just as promising a start as I'd hoped when I helped fund the project. It's a great pickup for people who enjoy a little mystery with their super-powered antic and perfect for Busiek acolytes. The Storyteller always has more tales to tell, usually with an implied moral, and this latest mini is no exception, as the man and his dog explore a man of the sea who's never satisfied with what he has and keeps searching for more in this first issue which features very distinctive art by Rebelka. I'm not sure we need the pretense of it being a "Jim Henson" product, but anything that gives me new anthology stories is good in my book, so feel free to brand it however you want, Boom!. The story itself is a fable that references a lot of things in a montage sequence, but I really like the way that Sztybor sets up the man's failure, allowing Rebelka to have free reign to draw fantastical creatures and real civilizations, all in a way that's very haunting, because the faces show such pain and loss. I'm looking forward to seeing what's next. If you like one-and-done fantasy, this is well worth reading. Things take a drastic turn when Amala, the NPC given life in a primitive robotic body gets close to the possible end of her quest to find the creators of humanity. With her "owners" on her trail and a possible dead-end (literally) on the other, Amala's choice doesn't appear to have a save point in this series that's entire too under the radar for how good it is. One of the bad sides to so many great comics is that sometimes you overlook things. That was me and Self/Made, which I caught up on over the weekend. The idea of an NPC based on human brainwaves that becomes a Frankenstein's Monster of sorts in that she causes disasters and unintended consequences is awesome. It's a great riff on the idea of computers and intelligence, and Ferigato's art reminds me so much of Sal Buscema and Ron Frenz in the layouts, facial expressions, and inking that I'm in love with this one from start to finish. With some amazing artwork and a story that plays with a potential reality for all of us, I'm all the way in and you should be, too. 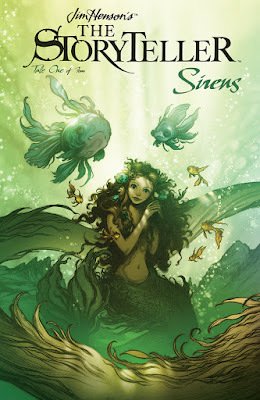 Bonnie quickly learns that you should never, EVER enter a labyrinth while the former King of the Fairies continues his scheming in the third issue of this fantasy series that takes some familiar characters from Shakespeare and puts them into a Gaiman-like story. 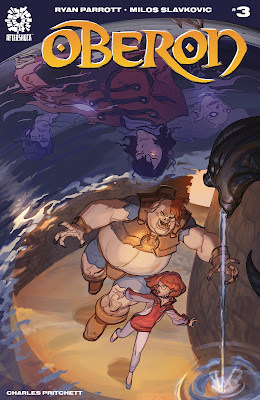 It's not easy to get me interested in a fantasy story without overt horror (I'm much more oriented towards science fiction as a reader and writer), so the fact that Parrott has found a way to make Oberon's scheming interesting enough to keep me past issue one is pretty impressive. I'll admit the structure of the comic doesn't always work for me--Oberon's narrator is purposefully all over the place, and sometimes the transitions aren't as clear as they need to be, which is either a failure of the plot or the art choices or a bit of both. But I love unreliable main characters and that's Oberon to a T. Slavkovic's portrayals of the characters works really well (I loved how he handled talking books and Mother Mayie is a cool design basically what if a woman with ill intent tried to make herself look like a good witch, with hilarious results). There's a lot of moving pieces that could tip this one off my reading list, but I'm on board and I think fantasy fans should have a look. 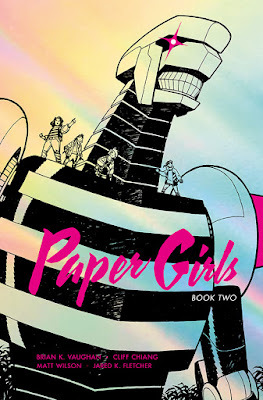 Paper Girls is my very favorite comic being published right now, full stop. My love of this book started with the 80's setting (I'm the exact same age as the characters), but it's so much more than a nostalgia trip. This is an incredible science fiction story where it truly feels like anything can happen, and it pretty much does. Insane time travel, multiple versions of characters, wonderful bonds of friendship, young romance, it's all there. Every once in a while a comic comes along and feels like it really has the magic, and Paper Girls is one of those books. The art on this book is consistently stunning, courtesy of the virtuoso Cliff Chiang, whose gorgeous, heartfelt illustrations bring crazy ideas to life on a page where he's equally adept at capturing humor, sadness, and the full range of human emotion. 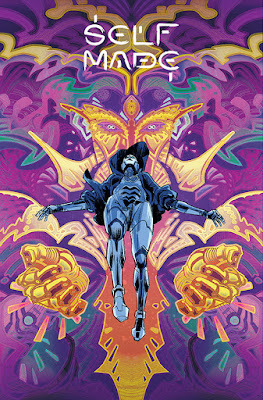 Matt Wilson on colors is a rock star, giving this book it's wild, neon, atmospheric colors that are so memorable. And every issue looks and feels terrific thanks to the design work of Jared K. Fletcher. Given that Brian K. Vaughan s writing, this is probably not a surprise. He's the author of some of the most popular and deservedly beloved comics of the past 15 years. Saga had that magic, and so does Paper Girls. That amazing alchemy that comes from an incredible combination of writer and artists and creative team, where what they make feels like something with its own life to it. These hardcover collections have incredible production values too, I plan on picking this up ASAP. Anyway, I absolutely adore this comic, and you will too. 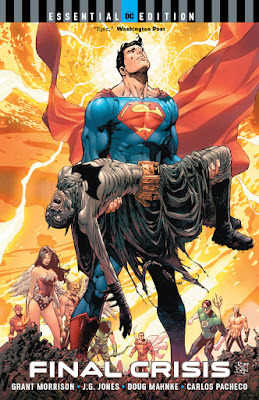 Final Crisis is an absolute delight. This book was coming out as I was getting back into comics, and I really enjoyed reading it even though I often didn't really get was going on. But what I appreciated was that this was the book that showed me that the DC universe was a weird, weird place, and that was in part what made it great. I was a Marvel kid growing up, and I've always leaned towards Marvel for overall universe and storytelling because I found their world a little more relatable (i.e., "the world outside your window" and all that, where people lived in actual cities, not made-up ones). DC seemed a little weirder, it's characters a little less like actual people. But what I love about Grant Morrison (one of the many things I love) is that he just completely leans into that weirdness. He embraces the fact that the DC universe is an absolutely insane place, and just goes from there. This is a story of big crazy ideas, and good and evil, and it feels like an event that is sort of teetering and about to topple over, but I don't think it does. I find it to be an incredibly satisfying read, with great moments of real heroism. This is a comics event that I'm legit excited for because I'm super invested in the story. The last time I really felt this way was Secret Wars, where the event was the culmination of years of storytelling that Jonathan Hickman had been doing. 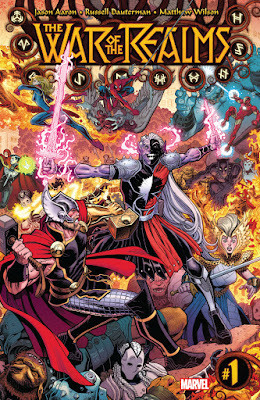 Similarly, Jason Aaron has been telling this story about Thor and the Realms and the various warring parties for almost 7 years, first in Thor: God of Thunder and then in The Mighty Thor (where he and Dauterman and Wilson told the truly wonderful story of Jane Foster as Thor. This is a war that's been building for a very long time, and it feels like a truly earned, organically built story. I'm excited to see it play out. I won’t stop recommending this title as long as the creative team keep producing the consistently engaging quality that they have with every issue so far. The last installment of the first arc doubles down on the already emotionally dark tone, if that was even possible. Gillen relishes in writing our character’s dimming chances for a way out of the RPG hell world by changing the rules like any good DM would. Characters moral centers are stripped with every choice presented to them. What’s best for the group, or what’s best for their individual self? The worse these characters are treated, the better this book gets. Can we please get those real life rules to the game based on this comic already? 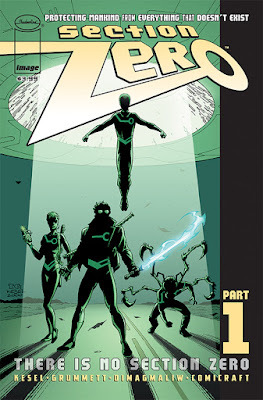 I didn’t know much about Ahoy Comics until I heard that they were going to publish the Second Coming series that was recently dropped by Vertigo. Decided to check out some of their other titles and I’m glad I did! 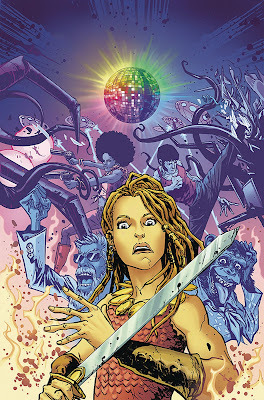 Bronze Age Boogie is for those readers that like their weird taken to the next level in their stories. Boogie feels like it could hi-five the Doom Patrol or Umbrella Academy in passing while crossing the universal comic cross roads on the way to genre bend the next stop in their story. Talking monkeys, time displaced characters, and zombie T-rexes. I’m sold.